From May through August, Joy O'Keefe and her field assistants collect data on national forest land near Franklin, North Carolina, for Joy's dissertation research on bats The area in which they work is part of the Southern Appalachian Mountains, one of the most biologically diverse areas in the United States. 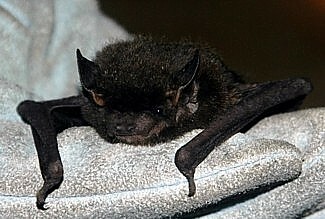 Although bats are not as speciose here as in the tropics, seven common bat species and three uncommon species that can be found near Franklin. For Joy's research, a typical day involves hikes off of Forest Service roads to set out bat detectors that passively record the ecolocation calls of bats. 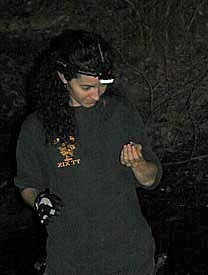 At night, Joy and her crew set up poles and fine mesh nets to capture bats over Forest Service roads. 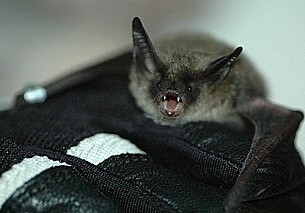 They target three species for further study: Northern Long-eared Bats, Eastern Red Bats, and Eastern Pipistrelles. 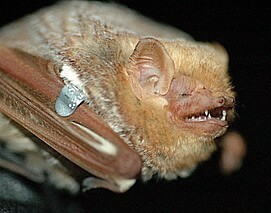 Some individuals are tagged with tiny radio transmitters. This enables Joy's team to track them to trees during the day, as each of these species is well adapted to roosting either in crevices, cavities, or in the foliage of trees in the forest. The goal of Joy's dissertation project is to gain a better understanding of how bats use the array of habitats available in a managed forest in the Southern Appalachians. 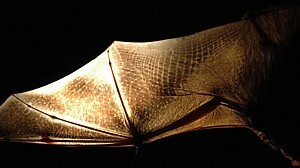 Forest managers interested in maintaining stable bat populations will be able to incorporate this new knowledge into their management plans.